This collection of works composed of oil paintings, drawing, installation, and performance is Boekhout’s response to the idea of ‘The Wheel of Fortune’ as a metaphor for our existence. Like a turning wheel, our lives ebb and flow. Experiences of change, failure, climactic achievement, etc. create our being and influence how we perceive and react to present and future. Boekhout borrows from mythical tales of Three Fates, the Goddess Fortuna, the She Wolf, Lilith, and Tarot to build upon her own mythology. Across several cultures, a foxes’ wedding describes phenomenon of rain failing through sunlight – a sun shower. In Tallahassee summers, it seems as if a foxes’ wedding happens every day. It’s an occurrence that begins without warning and passes quickly, changing the air and bringing a bittersweet beauty to the landscape. The artists sought to bring something of the experience inside, playfully removed from its natural context by using refuse and construction materials. The is an especially personal show for the artists, marking five shared years in Tallahassee. 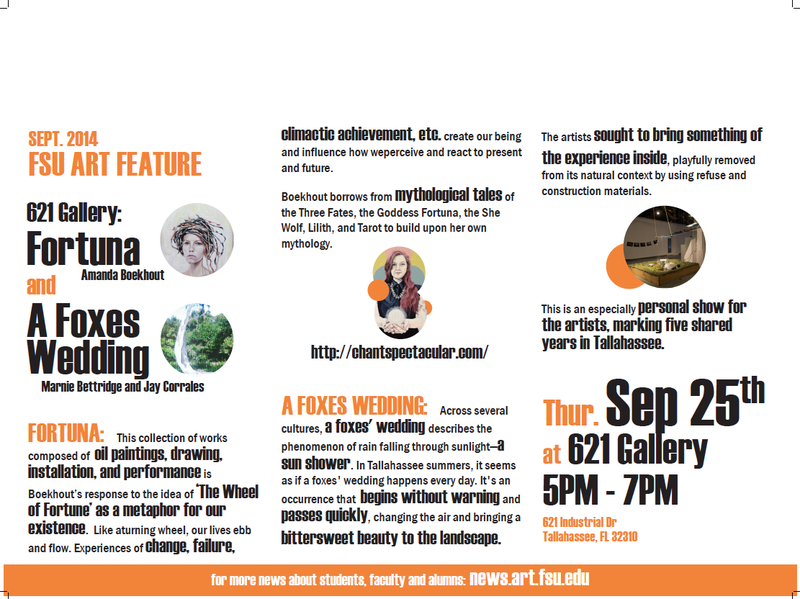 The shows took place Thursday, September 25th at 621 Gallery at 621 Industrial Dr. Tallahassee, FL 32310.